IGPDecaux SpA is the leading Italian player of Out of Home Communication. Exterior Transits, Subways, Airports, Street Furniture and Billboards are the media for our Out of Home and Digital Out of Home Communication Solutions, carefully integrated in urban environments to turn cities into more welcoming, pleasant and comfortable ones. Our goal is to build well-designed external communication, tailored to clients' needs, useful for citizens, of pleasant design, environment friendly and innovative. IGPDecaux operates within Urban Public Spaces, thus supports digital and infrastructural transformations of cities in motion, trying to shape a future of improved quality of life. 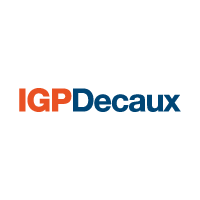 IGPDecaux was born in late 2001 from the merge between IGP, a company owned by du Chène de Vère family leader in transit advertising; JCDecaux Comunicazione Esterna Italia, branch of the French group JCDecaux; and RCS MediaGroup. From July 2015 JCDecaux SA and the du Chène de Vère family have bought the RCS MediaGroup share. This transition brought JCDecaux and the du Chène de Vère family to own respectively 60% and 40% of IGPDecaux assets.